This program celebrates the life and times of Swami Vivekananda (Narendranath Datta) (1863-1902) commemorating the Anniversary of his birth. 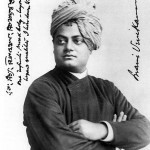 Regarded as India’s first great spiritual ambassador to the West, Swami Vivekananda is perhaps best known for his inspiring speech which began, “Sisters and brothers of America …” delivered at the Parliament of the World’s Religions in Chicago in 1893. We have selected Songs, Shlokas and Bhajans reflecting the philosophy of Swami Vivekananda, generating a secular social order through Religious and Ethnic Pluralism that would transcend differences of caste and creed and result in a unique place for India in the World. Our singers this morning are Sonali Bhattacharya, Aditya Das, Ashidhara Das, and Shyamoshree Gupta Diamond, with Anoop Bhattacharjya on tabla. All are outstanding artistes who have received praise and recognition for their performances and concerts both in India and in the United States.